The BC development team getting ready to ski out of the biathlon stadium at Whistler Olympic Park last weekend. While most people have moved on to other sports by May, the more obsessive skiers are starting the new training year on snow. 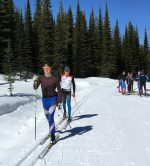 Canada’s “first” cross-country ski “races” of the 2017/2018 season were held on May 6. “First” because, while we haven’t exhaustively researched this, it was the first Saturday after May 1, which is the traditional new year for the Northern Hemisphere. “Races” is also a bit misleading as most athletes were viewing the events as an opportunity to do some intensity. Here then, in the order which photos arrived, are the places where people are skiing in May. Did we miss one? Share in the comments below or email photos with caption and credit info to info@fasterskier.com. 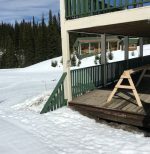 The Sovereign Lake Nordic Centre (SLNC) re-opened from May 4 to 7 for the Spring Fling camp and the “SLNC 1st Annual Pushups Classic Time Trial” race. The May camp has been running for years, but was moved to earlier in the month to ensure prime conditions. A number of clubs brought athletes out for technique lessons and long snow sessions. Canmore Nordic broke the pattern by focussing on low-elevation training with shorter training sessions. As the Canmore athletes live at 1,400 metres above sea level, the opportunity to train at 400 metres was more exciting than skiing at 1,700 metres. The first day of camp on May 4 was a warm one, but the 16 k of trails held up well. Julien Locke (Canadian National U25 Team) disappearing into the mist. Three generations of Williams (Madeleine Williams, her baby and her parents) enjoying the sun and snow. 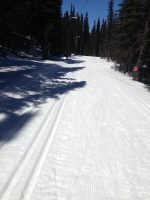 Canmore Nordic found bluebird skies and fresh tracks. Graham Nishikawa smiling early on the first of four long ski days for him. +17 C on Thursday, May 4, 30mm of rain on Friday, May 5, fresh snow on Saturday morning, and this salamander doesn’t care because he skipped the time trial. SLNC General Manager Troy Hudson (second from left) explaining the race rules to Gareth Williams, Annika Richardson and others on May 6 at the Sovereign Lake Nordic Centre. If the stairs are reappearing, it must be spring! The Canmore Nordic Centre lost its snow at the end of April, but Sunshine Meadows just a short drive west in Banff National Park hosted a large group of skiers starting May 9. 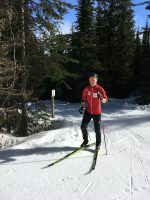 Ivan Babikov is leading a training block for the Canmore-based national team members, Chris Jeffries has the Alberta World Cup Academy crew, and a number of other groups are there as well. First ski at Sunshine of 2017! Hanging out at 2400m with awesome crust and great views today. OK, not in Canada, but Canadians Dahria Beatty and Russell Kennedy went and enjoyed some superb skiing conditions. They raced at Bysprinten in Mosjøen, Norway, and then moved on to Sjusjøen’s 100 kilometres of trails. 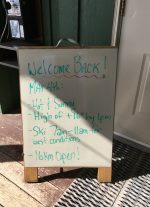 The Menihek Nordic Ski Club is officially closed, but has snow and will set track for Mother’s Day, according to club president Gerry Rideout. Whistler Olympic Park, Whistler, B.C. This venue is closed to the public, but has been hosting camps on natural snow. Biathlon got the first weekend of May and cross-country has the Victoria Day weekend. These photos are from the biathlon camp on the Olympic trails, mostly below 900 metres in elevation. The XC stadium in May sunshine. Skiers on the connector trail between Whistler’s biathlon and XC Olympic trails. The low bridge on the Olympic XC trails. The Hub, an intersection that leads to the lower trails, closed in April. 800 meters from the finish of the Olympic blue loop, with just Hermod’s Hill to go. “Callaghan Gold” got its name the first (trial) season in which WOP started storing snow in 2013. Sawdust (seen here in early May 2017) was used to cover the snow over the summer and discoloured it. Expect white snow this October.